Quanto Basta Canada 11 minutes Nicole Zimmer "Your job is to be a mother and a wife." An exploration of gender roles in Italian Canadian culture through Paola's struggle to get an education. EAST: A Relationship Canada 2 minutes Noor Khan 'EAST': A Relationship is primarily a short film about how an individual's relationship with people shaped her relationship with the land. The logo reads, 'EAST' alif / ya / seen / tah, in Arabic kulfic script. EAST, is where she comes from, the Middle East and South Asia, and it is also her location in relation to Toronto, i.e. Scarborough. Her relationship to EAST, both locations, have impacted her social standing, and social community. Through voice-over, she communicates the crisis of having been robbed of a homeland, while also settling and being complicit of the destruction of the home of Indigenous peoples. The heavy imagery of graveyards depicts the years in her life where she lost key members of her family. While burying them in the ground, she realized that her responsibility as a settler was critical, since there was no return home for herself and her community. EAST is a letter to her South Asian community to try to part from the past, and look at our current lives, where we (need to learn) to share the land. Kampung Tapir Malaysia 17 minutes Aw See Wee One Sunday afternoon, migrant workers Anne and her husband leave their five-year-old daughter from Kampung Tapir (Tapir Village), Malaysia. On the way to Singapore, their bus hits a wild Malayan tapir crossing the road, but no one is eager to save it. In the struggle of choosing a country to settle down in, Anne finds that she is like this endangered species, drifting between places to find a better life. French Guiana Brazil 19 minutes Edmilson Filho and Olavo Junior A story about the misadventures of Guiana, who works at the cabaret in Fortaleza City. Guiana dreams to live in France, until a mysterious woman promises to change his destiny. Belonging To Untouchable God India 26 minutes Anuj Kumar The story about Ramkali Devi and the remarkable work of a group of Musahar women in Bihar. Breaking traditionally bonded labour for upper caste landlords, these workers were subjected to exploitation and violence. They undertook the struggle to fight for their rights and justice which lead to significant changes in their lives. Port Triumph El Salvador 21 minutes Jeff Gould In the 1970s, the 1500 organized workers of Puerto el Triunfo, most of whom were women, were amongst the more privileged laborers in the country, thanks to their struggles. Then, state repression eliminated union leaders or drove them into exile. By 1990, the industry collapsed. The film provides a window into neoliberalism. Gut Feeling Canada 2 minutes Autumn Caldwell-Ivancic A girl is at work when she is asked to put something away. She doesn't feel comfortable with doing it, which leads to an accident. Haunted Witness Australi 10 minutes Daniel Clarke Trauma suffered by crime reporters is an under-reported and stigmatised issue. It is often forgotten or widely unacknowledged that like policeman and paramedics, journalists are first responders to daily scenes of horror. Admitting to experiencing trauma to newsroom colleagues, however, is widely denounced within the industry. The overwhelming majority of news people whose lives and careers are touched by traumatic stress are not covering brutal wars or natural disasters in distant lands. They are mostly domestic journalists who witness car accidents, murder scenes, suicides and plane crashes. Jeremy Hainsworth is a Vancouver-based freelance journalist who writes for the Associated Press, Bloomberg News and a variety of civil rights news outlets. During his illustrious career he covered Canada’s worst serial murder trial; that of pig farmer Robert Pickton. Hainsworth experienced horrendous nightmares during the trial, self-medicated with illegal drugs and later suffered a mental breakdown. He was diagnosed with post-traumatic stress disorder as a result of covering the Pickton case and years of crime reporting where he attended scenes of murder, suicide and fatal car accidents. Haunted Witness reveals how Hainsworth suffered in silence while management showed a shocking lack of support for his mental health and wellbeing. His story shines a light on the failure of media organisations to properly monitor and manage the mental health of their staff. Trabajadores United States 10 minutes Pedro Peira 55 years later, Arturo S. Rodríguez, President of the United Farm Workers of America, continues the task that César Chávez started, with the upcoming threat of the new Trump administration and the negative impact it may have on undocumented workers’ jobs and rights. Work Bolivia 12 minutes Alexandre Laprise and Pablo Rivero In October of 2017, people from more than 10 countries in Latin America and the Caribbean filmed their work routine. From dawn to dusk, a mosaic of daily difficulties, aspirations and dreams are revealed. It's an eye-opening look into how everyday workers are perceived and how hard it can be to get ahead. Everyday France 14 minutes Philippe Orreindy Françoise is a company director. She is under the perverse psychological influence of her superior. But is it real or is it a hallucination caused by her anguish? On Your Own Mozambique 27 minutes Fábio Ribeiro Mozambique has one of the most emergent economies in Africa but, in spite of its fast economic growth, the informal workers’ market is still the one that supports more families in the country. It’s the difference between being protected by labour laws versus being at the mercy of the employer. To be able to miss work one day to go to the doctor, when they are ill. To benefit from maternity leave. And, finally, to have a pension at an old age. Alberto, Victória, Crizalda, Beto and Amélia, like many other Mozambicans, are on their own. They talk to us about what is still to be done so they can contribute for the country and reap the benefits of their effort. Eusebio80 Spain 9 minutes Jesús Martínez and Iván Molina Eusebio80 is an analysis of the employment situation for the elderly in the not too distant future. It is set in the year 13 of the new era, after the Third World War where the most important capital cities are collapsed and bombing has reduced everything to rubble. Voices for Peace. Lands Venezuela 2 minutes Carlos Zerpa, Mecha Cooperativa, and Rodrigo García Voices for Peace is a short animation of the Colombian Peace Process with special attention in the personal experience and lifestyles of the Colombian conflict and the hopes of a country that begins to look forward to a future with social justice. Armando is an old man who has been working all his life, but now there is no economic safety for him. He cannot even buy his own medicine. In 2013, a good friend invites him to the rural strike and even though he was never interested in politics, he decides to join it when his boss makes him pay for a broken tarp. In the strike he passes from joy to fear, but the experience of communion with the other peasants makes him realise there is a national reality he has never seen before. 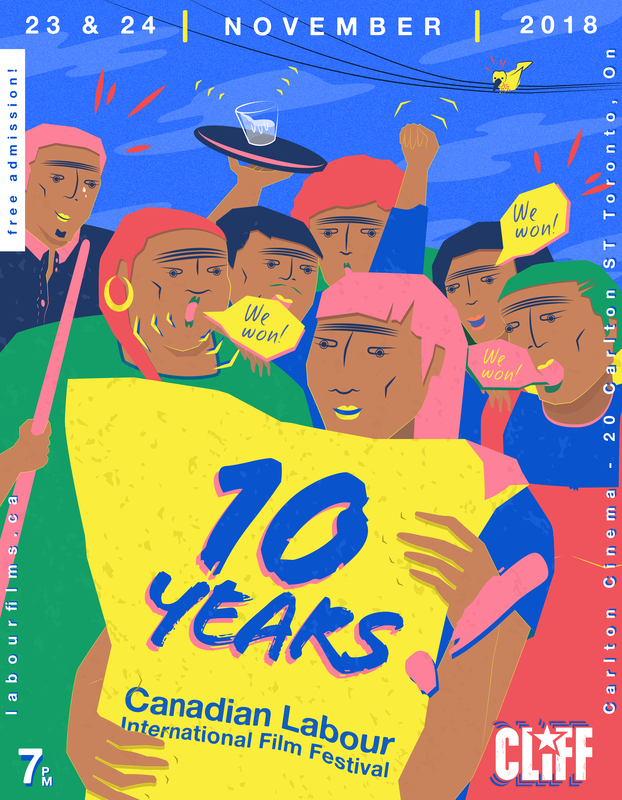 With the Peace Agreements, the reality may change because they are concrete solutions and a legal defence for workers rights. In the future, his grandson may go to college and have a better future. The Little Shoemaker France 6 minutes Galaad Alais, Terry Bonvard, Charley Carlier, Romain Cislo, Pierre-Yves Lefebvre, Philippe Lim, Benjamin Mariotte, and Karen Nawfal In a timeless street of Paris stands a shoemaker’s shop. Mr. Botte takes care of his shoes with such passion and skill that they come to life and start moving in his expert hands. Deal Argentina 14 minutes Gisela Benenzon Eva is a Paraguayan immigrant and works as a maid in the home of a wealthy family that has two little children. Eva takes care of them and raises them while her own children are far away in the care of their grandmother. Eva does not have the resources to support them and her reality is far from improving. Feeling desperate in an insurmountable situation, Eva finds a particular way of getting ahead. Bigman Businessman United States 3 minutes Clarisse Chua Businessman, Mr. Bigman, doesn't seem to be able to find the joy in his work life. Colombia 17 minutes Mateo Leguizamón and Alejandra Muñoz "Two themes" is a Colombian documentary short film that tells the story of Adriana; an artist, immigrant and fighter woman who symbolizes the entire community of street merchants and independent workers. These workers are persecuted daily by state laws that prohibit their right to work in the public spaces of big cities. In a social context of unemployment and lack of opportunities in life, traditional Colombian music has given her the right way to carry on with her life and of her child, motivating her to become the great harpist of mass transport, like Transmilenio. Our Story Italy 5 minutes Lorenzo Latrofa Emigration is a common territory that has involved many people all over the world. The stories of today's emigrants are the stories of our past. Their 'story' is our story. It is everyone's story. Porters. Slaves of the Southern Border Spain 11 minutes Amparo Climent “Porters. Slaves of the South Border” is a short film describing a day in the life of the porters from Melilla, at the Southern border of Spain. They have to wait endlessly outdoors, exposed to any weather condition: extreme heat, cold, rain… and obviously with no basic hygiene, health and security standards. They suffer harassment, insults, abuse, humiliation and even sexual aggressions from security forces on both sides of the border. They are educated or illiterate women, young and old women, married and not married, widow, or society outcast. They all try to survive. Most of them are the family breadwinner, supporting many children. Many of them have been abandoned by their partners. They suffer gender violence and abuse within and outside their families. The Beds of Others Spain 15 minutes Jonay García Laura is a sexual assistant for people with functional diversity. Her boyfriend, Marco, is desperate to find work to change the situation. Perhaps the only thing we all need is a little affection to feel alive. Terraform United Kingdom 5 minutes Sil van der Woerd and Jorik Dozy "Terraform" tells the true story of the hardships and sacrifices the sulphur miners of KawahIjen in Indonesia make to provide for their families. Life of Death Indonesia 5 minutes Jason Kiantoro and Bryan Arfiandy Death, while struggling to balance his work and family life, talks about his existence, his job, and his opinions on human beings in an interview from the documentary ‘Life of Death'. 17 years together Spain 15 minutes Javier Fesser "17 años juntos" (17 years together) tells a touching love story that began 17 years ago and remains as strong as it was on the first day. Under this premise, Fesser delves into the lives of two couples: Pepe and Asun, who have been married for 17 years, and Walter and Mardelina, domestic employees who have to take care of everything for the celebration. Although it is also Mardelina's birthday and both had asked for the night off. Nouvelle Cuisine Spain 5 minutes Manuel Reyes Halaby A chef that loves his job and enjoys the delicacies he cooks, is preparing a very different menu for a peculiar group of clients. 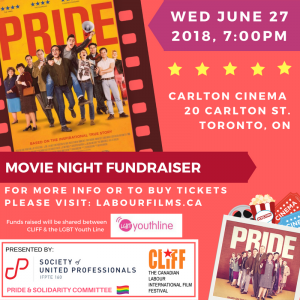 Join us on Wednesday June 27th, 2018 for a special screening of the movie Pride at Carlton Cinema in downtown Toronto! 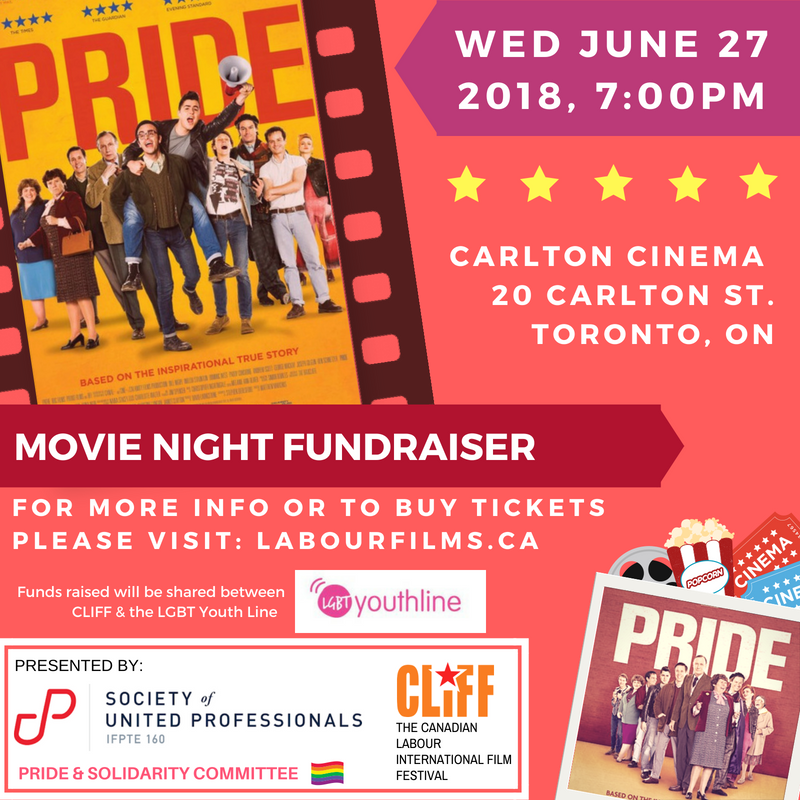 This special fundraising screening is being organized by the Society of United Professionals‘ (SUP) Pride & Solidarity Committee in collaboration with the Canadian Labour International Film Festival (CLIFF). PAY WHAT YOU CAN! All the funds collected will support and be split between the Canadian Labour International Film Festival and the LGBT Youth Line. Bring all the friends, family, and labour allies you want! And if you can’t attend, please consider purchasing a ticket and we can donate it to a community member! Just let us know! Doors open at 6:30PM and film starts at 7:00PM. For up to date information, please check out our Facebook Event Page. Email us at: info@labourfilms.ca for any questions. Pride (2014) is a critically-acclaimed comedy/drama based on a true story. The film depicts a group of UK lesbian and gay activists who worked to help miners and their families affected by the lengthy miners’ strike in 1984. This is an inspiring story that highlights the importance of solidarity between unions and social justice movements, and the absurdly funny bits that might crop up as the two learn about each other! The Lesbian Gay Bi Trans Youth Line exists to provide service for youth, by youth that affirms the experiences and aspirations of lesbian, gay, bisexual, transsexual, transgender, 2-spirited, queer and questioning youth in Ontario. Working within an anti-oppression and anti-racist framework, we provide leadership opportunities, outreach, confidential peer support and referrals by telephone, texting and online. Visit their website here. CLIFF 2017 Draws to an End! The 2017 CLIFF season has come to an end and we would like to extend our deepest thanks and gratitude to all our wonderful board members, volunteers, financial donors and sponsors, location coordinators, and attendees for making it a truly successful festival! In addition to our near full house attendance in Toronto on an abnormally frigid Friday night in early November, this year saw CLIFF screenings and events organized in over 20 cities across Canada, including: Vancouver, Edmonton, Calgary, Lethbridge, Ottawa, Sudbury, Halifax and more! We are also pleased to announce our 2017 film award winners! Congratulations to all the winners who will each be receiving a cash prize to help support them in making more excellent films! The CLIFF board will be taking a well-deserved break but will be back at it in January 2018 as we plan for our tenth year! Make sure to stay tuned for details! Finally, in case you missed it….we are in search of volunteers to join our board of directors! If you are interested in joining the team, let us know! You can check out the full posting here. And make sure to check out Talking Radical podcast where board members Scott MacDonald and Navjeet Sidhu were interviewed by Scott Neigh and discuss all things CLIFF! On behalf of our awesome team (Lorene, Frank, Scott, Abbas, Deedee, and Navjeet) thank you again and see you in 2018!